Will you fight to protect your rights? 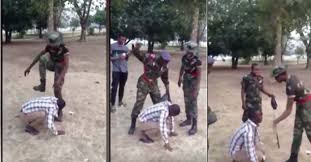 It’s no secret that members of the police force and solders in the army sometimes subject citizens to torture and degrading treatment. The Police may physically assault you while Solders who believe you have wronged them may usually order a citizen to frog jump or serve a type of punishment. Members of the armed forces I believe have a superiority complex to other citizens and make this obvious in their interactions with citizens. For instance calling a female solder beautiful can earn you a lot of trouble as experienced recently. 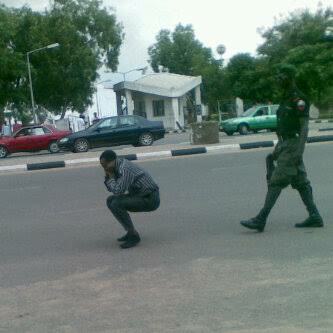 This begs the question, what happened to our human rights as Nigerians? How come it gets trampled on by those who swore to protect us and how come we always feel helpless when faced with such situations. A friend who listens to your story of torture will most likely advise you to thank God that you lived to tell the story, rather than advise you to sue in court for the enforcement and protection of your human rights. Can we however blame such a friend, very few citizens believe in the administration of justice system in Nigeria. Many people believe only the rich can get justice, a statement I don’t agree with having appeared in court several times and witnessed litigants obtain justice against large corporations and more wealthy opposing litigants. Section 34 of the Constitution of the Federal Republic of Nigeria (1999) provides that every individual is entitled to respect for the dignity of his person, the section further states that no person shall be subjected to torture or inhuman or degrading treatment. Neither shall any individual be held as a slave or required to perform forced or compulsory labour. Therefore, when a police man slaps a citizen or a solder orders him to perform some form of punishment, is that degrading enough to warrant a breach of his rights or does he have to wait till he is beaten and locked up in a cell? The Court of Appeal in A.G & Commissioner of Justice, Kebbi State V. Jokolo & ors(2013) LPELR-22349 stated that a degrading treatment is to do unpleasant things to someone and to make him lose self-respect. The big question now is when your guaranteed right to dignity of human person is breached and trampled upon. What will you do, cower into your private corner to lick your wounds quietly and thank your stars that you are not dead or will you rally civil society and bring an application for breach of fundamental human rights before the court. Remember that if we don’t stand for what is right now, we will all fall for what is wrong.